These corbels have a story. It is a story ,unique in nature, like a fortune from the heavens. Ok maybe that’s an overstatement, but things have a way about them sometimes. We are often left feeling unworthy. We were talking about where we could possibly find : two large corbels (brackets) for our loft area that were built from a exterior grade wood, reclaimed, and at a bargain price of $2.00 for the set. I know this sounds unlikely, with the market for reclaimed materials in such demand for these items, but we put it out there. Meanwhile in our tiny, sinful city. There was an old house being destroyed nearby that we were unaware of. They were allowing people to remove anything that they wanted prior to demolition. 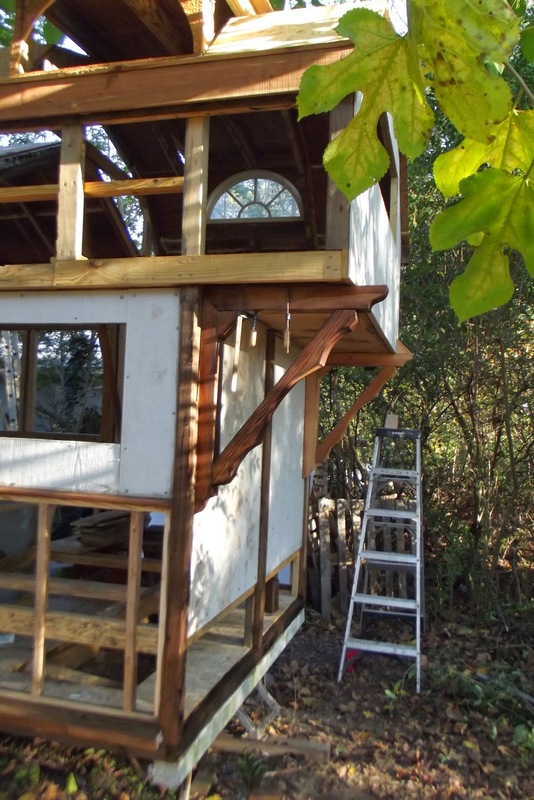 Windows, doors, trim work, everything. Dave’s mom knew someone who had gotten six corbels (brackets) from that house and was asked if she wanted them. She knew they would be perfect for our tiny house, so she gratefully accepted to take them. The corbels were resized just a lil bit. The angles were corrected on the brace to accept this change. The cut off piece was then sawn in half. One half became the support block and the other half became the end cap. It added some mass to them and gave them a sense of weight. Something Dave felt was needed with the original piece. The loft section has been closed in. The window in the rear was reused from the original travel trailer and fits perfectly above the upper bed. We installed the emergency exit window in the lower sleeping area below the loft. 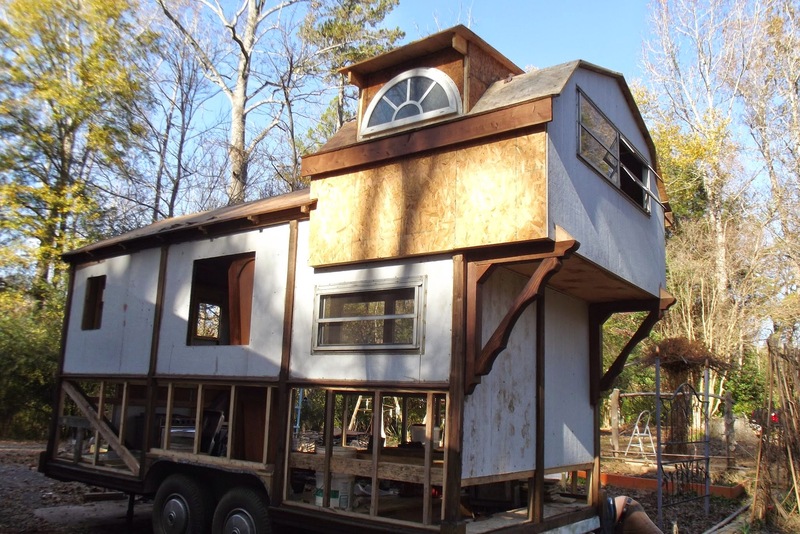 We reused it from the original travel trailer. Both arched dormer windows are in, they were reclaimed as well. Dave’s mom (who by the way is a seasoned pro with reclaimed and reused building supplies.) bought these windows along with two others probably ten years ago. Two have been used in her own house. She graciously donated these two. We have been planning to incorporate them into our design from the start. 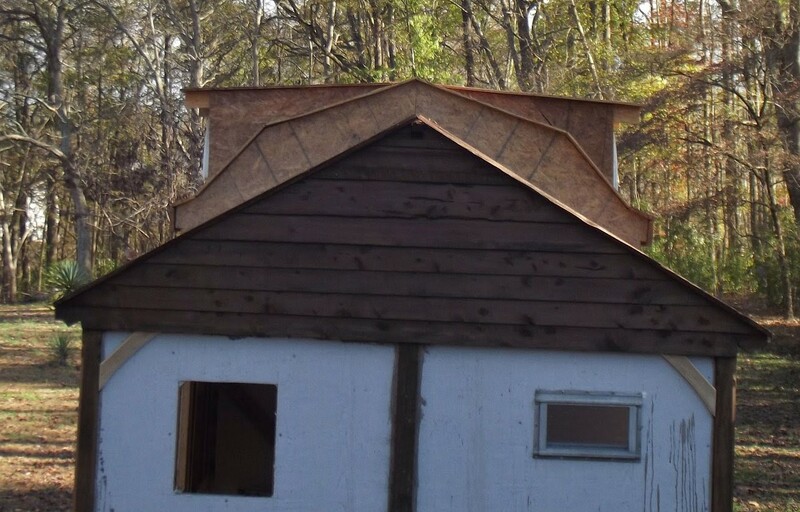 The picture above shows the roof line and how all these relate to each other. Our primary concern with a loft was head room. Dave is 6′-3¨ tall and needed room to accommodate that. 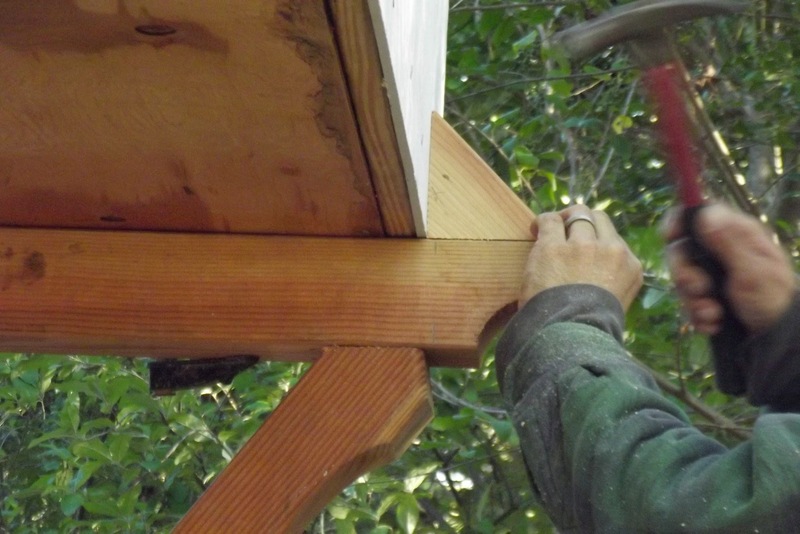 He chose to build the loft roof in a gambrel ¨barn roof¨ shape. Which not only looks great, but allows much more space inside. This design hopefully will allow warm heated air in the winter, to rise up and become trapped in the area we sleep. The rear window opens to allow warm air to escape in the summer months. The dormer windows allow light to flood in from each side giving the entire sleeping quarters a light, open feeling and provide a full range of views. We will certainly enjoy that. We have the textured glass window, again from the original camper, installed in the shower area, visible in the picture above. Everyone says it ¨winks at you¨. I think it kinda does.